Funny. I’ve been trying to get my stress and anxiety under control since I collapsed into a heap of wracking sobs in front of my math teacher in high school because I was in school full time, socializing full time and working eight-hour days on the weekends, so couldn’t complete my math homework. Ironic, perhaps, that a yoga teacher would struggle so much with stress, but ask any one of us and we will probably tell you that’s how we got into this field in the first place. Yesterday, I noticed a billboard for a coffee shop advertising an even faster way to pay. The image was a coffee mug and a doughnut moving so quickly the doughnut’s sprinkles were flying off. Sitting down for a coffee and a doughnut used to mean a pause from a stressful day, a quiet moment before having to rush off again. Now a “coffee break” is another cog in our Faster Machine. 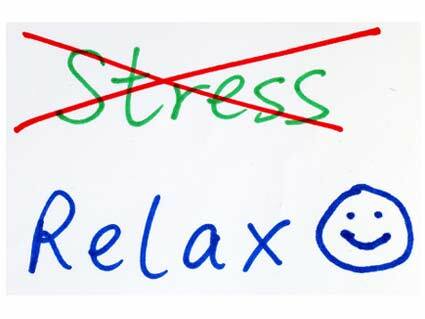 What appears to be happening is a slow but certain takeover of our sympathetic nervous system (SNS), sometimes called the “stress state,” from the parasympathetic nervous system (PNS), which governs healing and rest. Both systems are always present in the body, but one is usually functioning more than the other. Calling the SNS the “stress state” gives it a bit of a negative connotation, which isn’t quite right. We need stress to survive, and having appropriate periods of stress gets us out of the house in the morning, helps us follow our dreams, and yes, if necessary, helps us run away from a bear. The problem is that our SNS easily gets stuck in the “on” position. Even when we appear to be relaxed, the SNS is still highly functioning, preventing the PNS from taking over and allowing us to rest, digest, process emotion, and stimulate the immune system. Nightmares and clenched jaws indicate that we can even sleep in a stress state. If you’re like me, being at a low buzz of stress feels so normal that deep relaxation and stillness is so unfamiliar it’s almost uncomfortable. Our stress habits are so strong that, ironically, being comfortable is beyond our comfort zone. The good news is that even though the SNS is very easily triggered, there are triggers for the PNS as well that we can practice more often to rehabilitate our stress addictions. The most important tool we can use to retrain ourselves is awareness. What does it feel like to be in a relaxed state? What triggers me back into a state of stress? What are the signs? In order to see these signs, you must first know what it feels like to be relaxed. Actually relaxed. Viparita Karani, or Legs Up the Wall, is a yoga pose that strongly stimulates the PNS, and all you need is a floor and a wall or even a bed or couch. If you can get out to a restorative yoga class, even better, but this is one you can do everyday. Always check with your doctor first if you are pregnant or have any health concerns. Sit with one hip touching the wall. Roll down onto your forearms as you swing your legs up the wall, and shimmy as close to the wall as you feel comfortable. No need to touch the wall with your bum. Lie on your back, hands on your belly, out to the sides or up overhead, whichever one feels most comfortable to you. Lifting your legs off the floor tells your body in no uncertain terms that you are not “on the go” right now. Your sprinkles are going to stay firmly on your doughnut here. If you have a bolster or pillow, slide it under your hips and adjust it for comfort. If you have a blanket, drape it over your legs for warmth and support. If you have an eye pillow or a scarf, place it over your eyes. Warmth, comfort, quiet, and darkness are a few excellent PNS triggers. You can stay here for up to 20 minutes if you are comfortable, but five minutes is enough. When you are ready to come out, do so slowly, bending your knees and rolling onto your right side before you come all the way up. Take your time and remember this feeling of relaxation as you notice what triggers you back into your SNS. Now we have a program for stress rehab. Good luck, and godspeed you keep your sprinkles on.